All my newly added content since Saturday has no duration - which has a few side effects: just starting playback sets the "played" indicator and no resume points are being recorded. I've updated to 3.0.5575.38105 and durations are now being determined correctly for newly added content. Is there a way to force a mediainfo refresh for either my entire collection or individual titles? The only way I can think of is to remove all my newly added stuff, perform a scan, and then re-add that content and perform a scan again - but that's going to be a bit painful. Edited by AdrianW, 08 April 2015 - 05:51 AM. An easy way to find any episodes with blank durations is to go to "Reports", select Episodes from the drop list and then sort by run time. I've managed to fix all of mine by using Metabrowser to change the value of an unused metadata field (I used Comment) on all my recently added shows (using a filter and multi-select), ran a scan, and then changed that field back to blank. yep.. just saw this on an episode last night where it played fine but we were "at the end" (progress bar) the whole time and the wife commented about it..
i'll likely do some manual fixups in metaB as well.. good idea on the multi-select to "add" the items again. Weird - I had a couple of hundred episodes in this situation, and just adding the comment and scanning fixed them all. I'm on 2.3.50 of MetaB, are you on the same version? Again - changing the metadata field is not going to help - except if it also causes the entire item to be completely refreshed. You will need to do an advanced refresh to force ffprobe to re-run. I have tried Advanced Refresh several times (Update all metadata) but still nothing, duration is not being updated. Advanced refesh seems now to be picking up the media duration into media info. However, image chapters are still not being extracted. 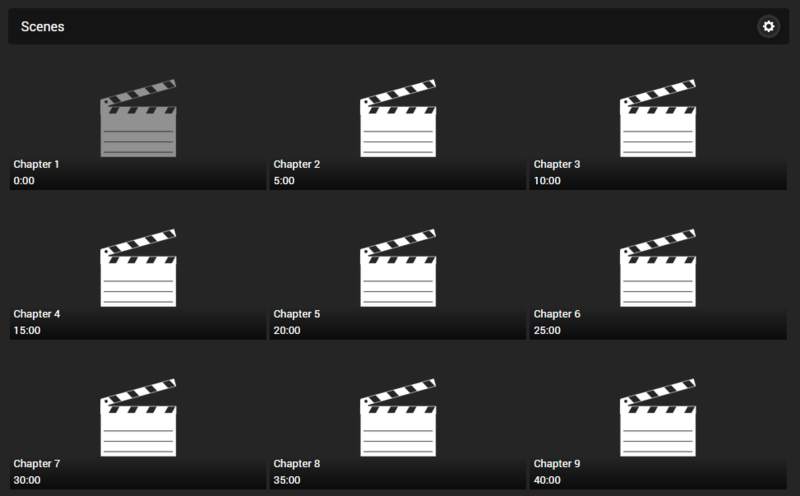 You'll need to run the "Chapter image extraction" scheduled task to get the chapter images for those episodes. @Luke - there's something gone wrong with Chapter extraction again. I'm running 3.0.5578.39115 and the correct duration is being detected and chapters are created - but no images are being extracted. Here's a complete log - all I did here was start the server, perform a scan (adding a single episode - 12 Monkeys S01E13) and then I restarted the server again. 2015-04-11 16:59:37.2048 Debug - App: Saving \\KANAME\Video\New TV\12 Monkeys\Season 1 to database. 2015-04-11 16:59:37.4748 Debug - MediaEncoder: C:\Users\Adrian\AppData\Roaming\MediaBrowser-Server\ffmpeg\20150331\ffmpeg.exe -ss 00:00:15.000 -i file:"\\KANAME\Video\New TV\12 Monkeys\Season 1\12 Monkeys S01E13 Arms of Mine.mkv" -threads 1 -v quiet -vframes 1 -vf "scale=600:trunc(600/dar/2)*2,thumbnail=30" -f image2 "-"
2015-04-11 16:59:37.9248 Error - MediaEncoder: I-frame image extraction failed, will attempt standard way. Input: file:"\\KANAME\Video\New TV\12 Monkeys\Season 1\12 Monkeys S01E13 Arms of Mine.mkv"
2015-04-11 16:59:37.9248 Debug - MediaEncoder: C:\Users\Adrian\AppData\Roaming\MediaBrowser-Server\ffmpeg\20150331\ffmpeg.exe -ss 00:00:15.000 -i file:"\\KANAME\Video\New TV\12 Monkeys\Season 1\12 Monkeys S01E13 Arms of Mine.mkv" -threads 1 -v quiet -vframes 1 -vf "scale=600:trunc(600/dar/2)*2" -f image2 "-"
2015-04-11 16:59:38.1249 Debug - App: Saving \\KANAME\Video\New TV\12 Monkeys\Season 1\12 Monkeys S01E13 Arms of Mine.mkv to database. Edited by AdrianW, 11 April 2015 - 05:09 AM. Indeed I ran the Chapter Image extraction scheduled task. However, as you later mention, Images are not being extracted. Same output you have here... chapters identified (I think that has to do with durantion now being properly identified) but no chapter images. Version 3.0.5579.23399 just fixed the chapter extraction, or claims to anyway. I was having this issue myself, but wasn't sure/didn't have the time to figure out any rhyme or reason to make a bug report. So it's great to see it's fixed. EDIT: Nope, it doesn't address the issue from what I can tell. Edited by SikSlayer, 11 April 2015 - 10:32 PM. Just testing this release... however I am getting the server to crash (already reported this on another thread). AddImages method is failing (I guess this is related to the issue with chapter image extraction). I will reboot my server and see if that helps. Chapter images are now successfully being extracted for me with version 3.0.5579.26082. Indeed it does. Pressing refresh in the title that wasn't showing chapter images before, then refresh the page after a moment, and they will appear. Using the chapter image extraction in the scheduled tasks section won't do it.